How do the "creatures" support one another? This week students have been considering their passions, goals and opportunities in order to develop potential business concepts. Today students will share their ideas with the rest of the fifth grade. Teams will then be created based on interest. video : Is Your Idea Viable? 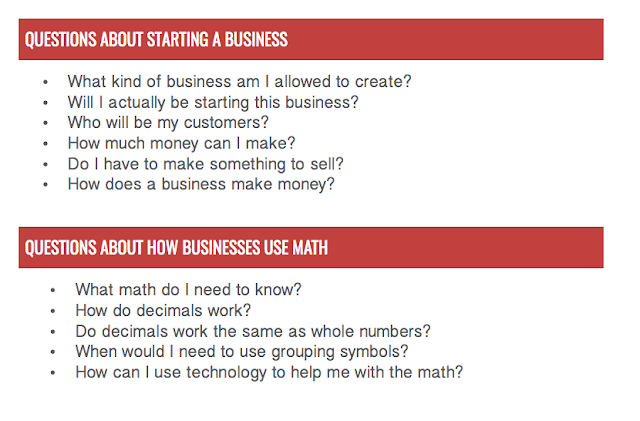 Use these questions to get your thought process into action! Students will read the following articles and explore the websites with their classes and reading groups. She isn’t even in middle school yet, but Andie Nugent is already taking the science world by storm with her inventions and creative spirit. We hope that her story will inspire other kids to follow their dreams of being an inventor, and we at littleBits are proud to give them the tools to get there. Learn more about littleBits here! PS Andie is Mrs. Whitney's cousin and Mrs. Nugent's grand-cousin! How cool!